My mother has been gone for over 10 years now. She didn’t talk much about her life, and in many ways she was an enigma to me. When I was born she was almost 40, so I didn’t know her in her youth at all. But the photographs tell their own story. The photos are from the late 1930s when she became a young woman, the 1940s when she was in her 20s, and the in 1950s when she became a mother. They are from her life in New York City before I was born. 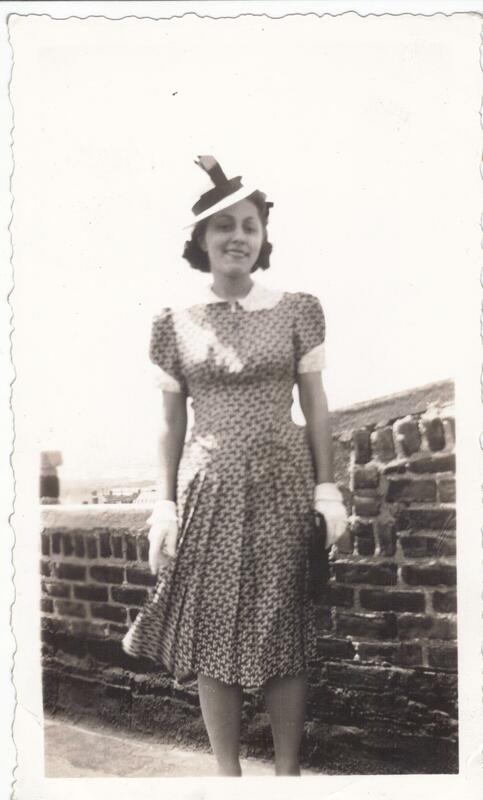 I see so much interest in vintage fashion that I thought it would be interesting for others to see what an “ordinary” woman of the time wore. And it’s another chance for me to discover who my mother was. This will be an ongoing series. The photos start in earnest in her late teens and she seems to be posing, showing off her outfits, and being proud of her newly blossomed beauty in many of the photos. I wonder what kind of camera they were taken on, and who is taking the photos. This photograph was taken in 1939. I like the saucy way the hat is positioned on her head. She looks confident that she is pretty in this dress with the white collar and cuffs, the fitted bodice and the box pleats on the skirt. The finishing touch is her little white gloves, and a clutch purse. It looks like it was taken on the roof of the building she lived in. I wonder if it was taken by one of her older brothers who had bought a new camera. I wonder if while growing up her mother made her clothes, and now she is enjoying being fashionable for the first time. I don’t know the parks and the bridges, the buildings and the streets she is posed in front of in these photos. This was her world, not mine. 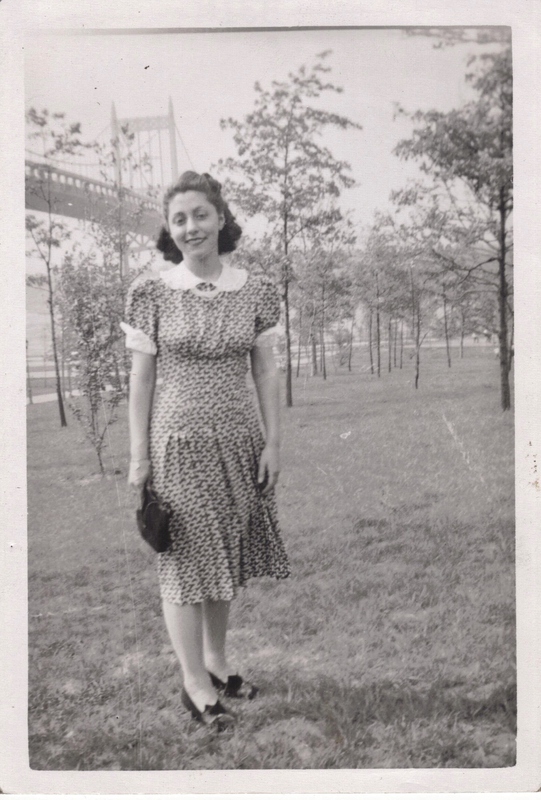 This entry was posted in Vintage Fashion and tagged 1930s fashion, New York City 1930s, vintage clothes on February 9, 2013 by Stitch It Again.